The Danish designer truly creates organic furniture and lighting. Jonas Edvard’s MYX lamp is made from plant fiber and fungus grown over the course of two to three weeks. A detail shot from his Gesso collection of side tables and lamps features a composite of limestone and bio-resin. The designer working in his studio. The Gesso collection features lamps made from limestone and bio-resin. To create the MYX lamp, Edvard grows the mushrooms for about two to three weeks. The result is a sustainble light made from dried mushrooms. If furniture and lighting design is the work of wood, metal, plastic and glass, then Jonas Edvard is changing all the rules. How about a seaweed chair? Or a mushroom lamp? The 33-year-old’s thought-provoking designs all begin with the raw ingredients of nature’s own building blocks. 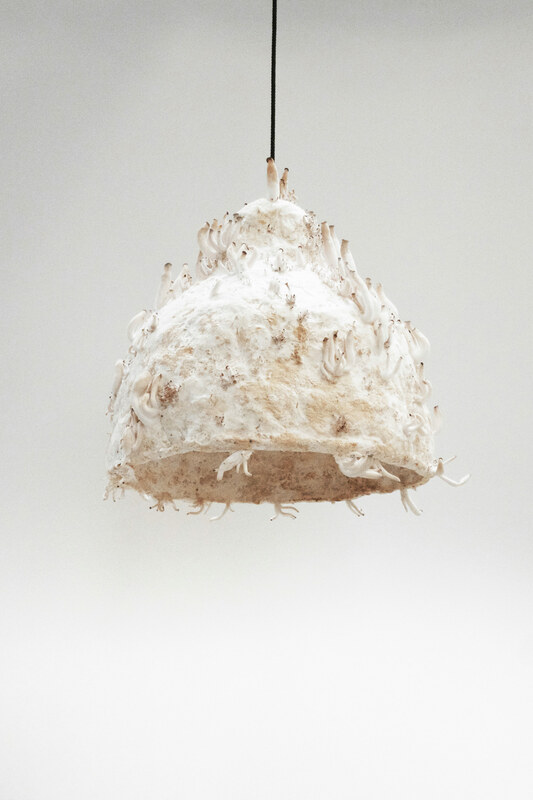 His MYX lamp, for instance, is not built, but rather grown—from mycelium, the fungal root material that produces mushrooms. The mushrooms are harvested (and eaten!) as they form into a mounded bed, leaving behind the textile-like root system to dry and transform into a lightweight lampshade. In another product range, Edvard and codesigner Nikolaj Steenfatt use the natural polymer in seaweed to create a material that’s soft like cork and tough enough for chairs. The resulting pieces are modern and functional, with a tactile earthiness that makes the designer’s focus on sustainability clear.